Thinking of making a homemade longganisa? 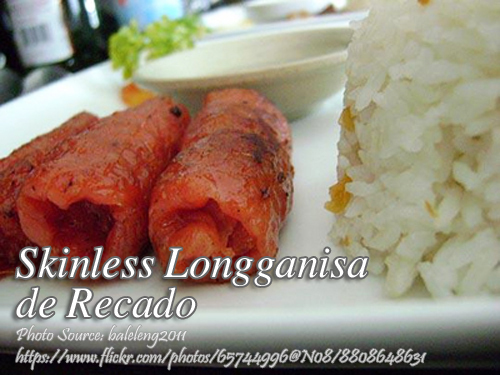 This simple recipe I have here is skinless longganisa de recado and need no pig’s intestine casing. All you need is to wrap it in wax paper and roll it until it forms into log shape. Freeze it and when you are ready to cook it, you only need to remove the wrappers and fry them. To make longganisa de recado; Remove tough outer skin of the pork, leaving the fatty layer. Grind the pork finely or pass thru the steel blade of a food processor. In a large bowl combine the ground pork and the rest of the ingredients and mix thoroughly. Cover the bowl with aluminum foil or plastic wrap and keep in the refrigerator a few hours or overnight. Cut squares of waxed paper about 6 x 4 inches. Form pork mixture into logs and roll in waxed paper. Store in the refrigerator or freezer. Makes 48 skinless longganisa. How would it taste without salitre? Hi, I wwll just taste less salty. Salitre is a combination of table salt and sodium nitrate.